As you can see, there will be an "Offer Requested" section that will show you the title and starting at price (if provided) for the Offer the client has selected. When a client requests a Quote from the Offers section of your Profile, information for the specific Offer the client requested will also appear in the Lead Info section for that Gig ID# in your Member Control Panel. We've made it easy for you to include an Offer in your Bid email. Go to the Rates & Deposit section of the Bid. The image below shows you what this section looks like in your Member Control Panel. When you choose the title of the Offer response you wish to use, you should see the “Rate” fill in (if you have entered a “Starting At” price for that Offer). 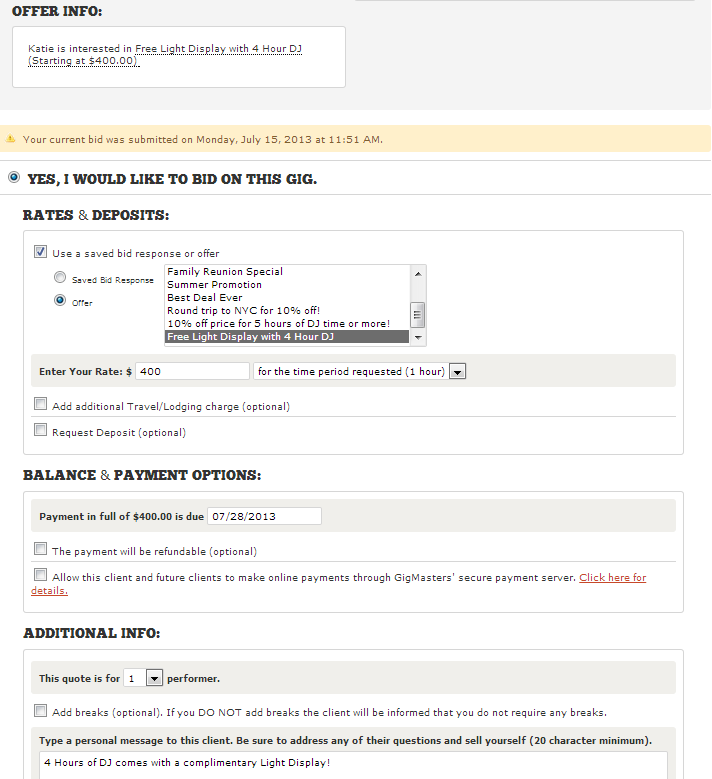 As with any other Bid, you can still customize your Rate to fit the client's request. You’ll also see text appear in the “Personal Message” section if you filled in “Additional Client Information” in the Edit Offer box when you initially created your Offer. 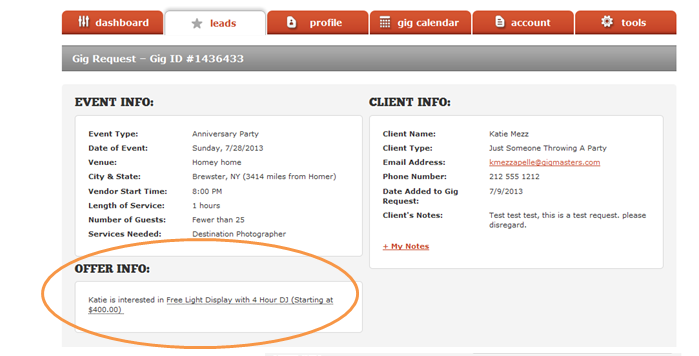 It's important to click “Preview” to review the bid before you send it to the client. It’s also important for us to note that in order to prevent confusion, we have turned off Auto-Add for requests that are generated from the “Request This Offer” section of a member’s Profile. That means when a client requests a quote from the Offers section of your Profile, you will be the only person to receive that particular lead. Similarly, you will not see Offer requests that were generated from another member's profile. If a client requests a quote from you and you feel that one of your Offers is relevant, you can always choose that Offer response when bidding on the client's event. If you need help creating Offers for you profile, swing by our other blog post that walks you through that process. If you have any questions about creating an Offer, responding to leads with an Offer, or anything else for that matter, our Customer Experience Team is here and ready to help! 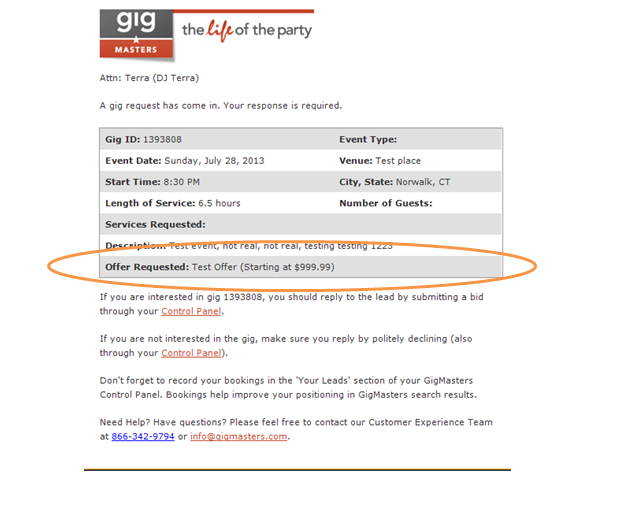 Just give us a call at 866-342-9794 or info@gigmasters.com.